ARMN’s Membership Committee posts occasional profiles of our members, including how they came to be master naturalists, which parts of nature they most enjoy, and how they affect their environment. The latest biography features ARMN Membership Chair Bill Browning, who started this series. Bill will be stepping away from the profiles to focus on additional responsibilities, but we wanted to thank him for introducing so many members to the ARMN community. Do you know someone in ARMN with an interesting story? Or do you have achievement you’d like to share? Contact Stacey Evers (stacey.evers@icloud.com), who has taken the reins. I grew up in Portsmouth, NH, where my roots are five or six generations deep. It wasn’t a rural town, but I did spend a fair amount of time playing near the swamp in our neighborhood that doubled as a skating rink in the winter. We used to play kickball in a friend’s yard that was next to the swamp and I had a rule that I had to come home when the street lights came on. My mother didn’t have any trouble enforcing that rule as the mosquitos and diving bats drove us inside at about the same time. My parents didn’t do that much to expose me to the natural environment in terms of hiking or camping or nature walks, but they did teach me about recycling and conserving natural resources. They also had the good sense to enroll me in Boy Scouts. At Boy Scout summer camp one summer, I remember participating in a scavenger hunt and volunteering to find a white birch tree leaf. It seemed a lot easier than some of the other things on the list. I thought, “How hard could this be?” There were birch trees all over the campground and I had learned in primary school that the state tree for NH was the white birch, which I now know as Betula papyrifera. Anyway, I returned to the counselor with many birch tree leaves, and he rejected every one of them. It turns out that almost all of the birch trees in this particular camp were yellow birch, Betula alleghaniensis, another important species in the northeast. It was one of my earliest humbling experiences as a naturalist. Since graduating from the University of New Hampshire, I’ve lived in several states (Massachusetts, Ohio, Wisconsin) and one foreign country (Taiwan) before settling in Arlington to raise my family. No matter where I’ve lived, the most memorable things I’ve done on my own or with friends and family have involved outdoor activities: a hike, a bike ride, a camping trip, a cross country ski experience, or whatever. My wife and I heard about ARMN from a friend at church. I was looking for a volunteer activity that would branch me out from school politics, and she encouraged me to check it out. She believed (rightly so) that I would like hanging out with other adults who cared about the outdoors. I took the training in the fall of 2013, and the rest is history. I serve on the ARMN Board as our organization’s Membership Chair. I help keep track of our group’s volunteer and continuing education hours. As such, I work with individual members to help ensure their hours are recorded accurately. 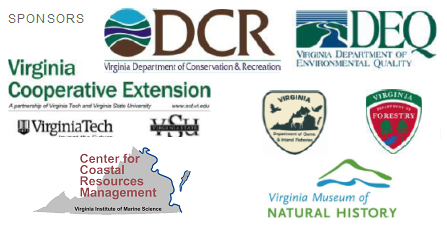 And I help our chapter president prepare our annual report for the state-wide Virginia Master Naturalist organization. I’ve also been one of the organizers to help rehabilitate a 3-4 acre park behind Powhatan Springs Park, downhill from Upton Hill park and up the creek from Ashlawn Elementary. One of the most rewarding parts of this experience for me has been to watch the neighborhood members and the skate park users get enthused about this effort and participate in the work. I studied theoretical mathematics in college and international economics in graduate school and, as a result, my professional life for the last 30+ years has involved working in abstract concepts. The ARMN training took me out of my comfort zone and I struggled to retain the material. To compensate, since that time I have regularly been taking classes through the Audubon Naturalist Society in its Natural History Field Studies Program. I figure if I keep showing up at these classes, some of the material might actually sink in and stay with me. My kids didn’t stand a chance in the nerd gene category. I met my wife grading calculus tests in college. And the car games we invented to pass the time during our trips to New England usually involved mathematical computations vice pop culture or literature.